Photography is an essential element of every wedding celebration. Pictures taken by a professional photographer are extremely important because they capture the memories of the most beautiful event in every couple’s life. Since your wedding is one of the most important events in your life, framing your wedding photos becomes a very important task. A picture frame will make the photos even more tender and magical as you look back over the years! Many couples search long and hard for a good wedding photographer. Yet in most cases, once they get the pictures, they just lock them away in the bowels of a computer or on a disc somewhere and never look at them again! There is an easy way to review the images that were made on the happiest day of your life, as well as to share them with other people – mount them and set in beautiful picture frames! Printing wedding photos and putting them on the wall seems an obvious solution. However, when you live in an apartment or a small house there is a risk of turning a small space into a kind of wedding museum. There is another solution – designing and framing wedding photos on a computer is the easiest way to view ALL of your favorite wedding photos! You can share them with friends, and create a romantic wedding album. And this definitely will not make it seem like you are obsessed. 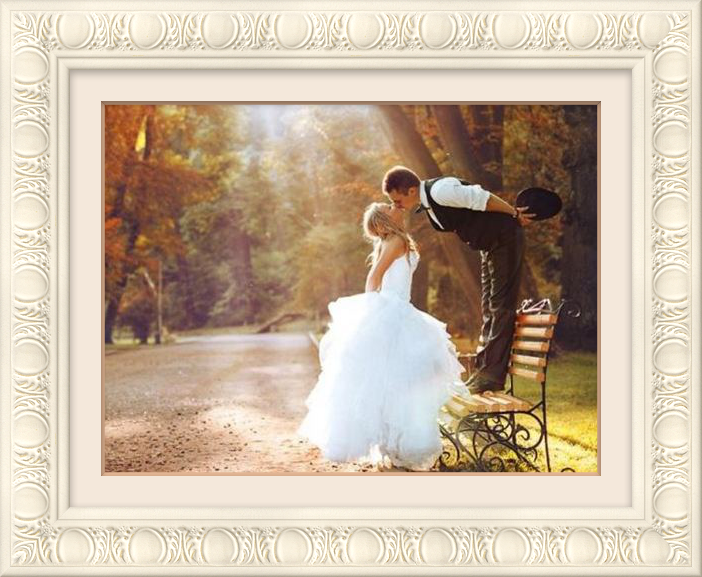 The most appropriate colors for wedding photo frames are gold, silver, white and beige. Don’t overload a wedding frame with flowers, hearts and doves, because the photo has to look stylish and not have anything distract from the main subject – the bride and groom. Wedding photos use the same framing rules as any other images, so they definitely need a mat to give more space and volume to the pictures. 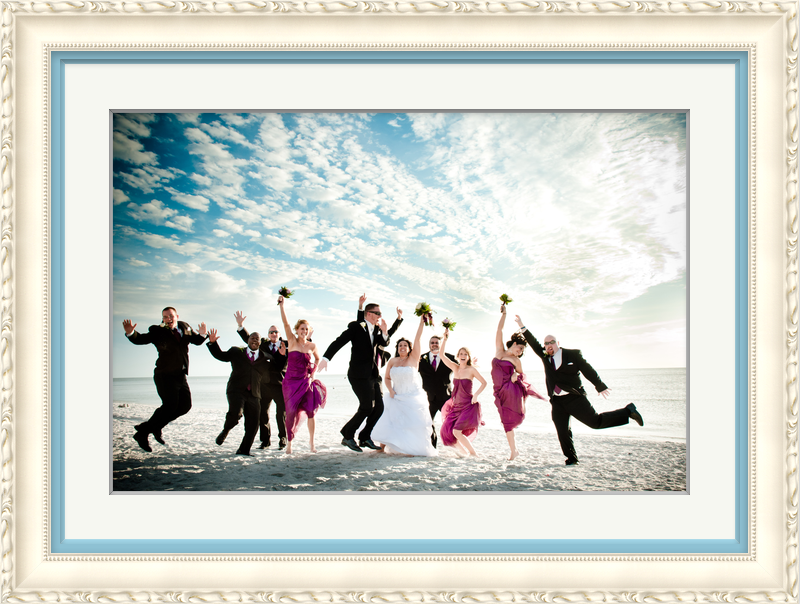 The main point in framing a wedding photograph is to find your own style. It is important to make it recognizable, attractive, memorable and associated with you. Wedding photos can be used in many different ways. For example, they can also be used as invitation cards for a wedding or an engagement, or even as perfectly designed Thank You notes. What if you eloped to get married, or had a very small wedding? Well, afterward it is common to make an announcement, and there is nothing easier than to email to all your friends and relatives with the best wedding photo, mounted in a cute picture frame with appropriate text. In fact, it’s these small details that bring pleasant emotions along with them! Not only that, – you can always post wedding pictures to the Internet (Facebook, your personal blog, etc.) and share the link with friends and family, so that everyone can remember the significant day. ImageFramer is here to help you realize the most creative uses of your wedding photos. Here you will find the finest selection of frames – ivory or white with silver, contemporary or carved with ornamentations. Moreover, mask frames will give a distinctive look to your wedding photos, and help you to turn your favorites into invitations and thank you notes.